These homeowners moved to the Midwest from Switzerland. 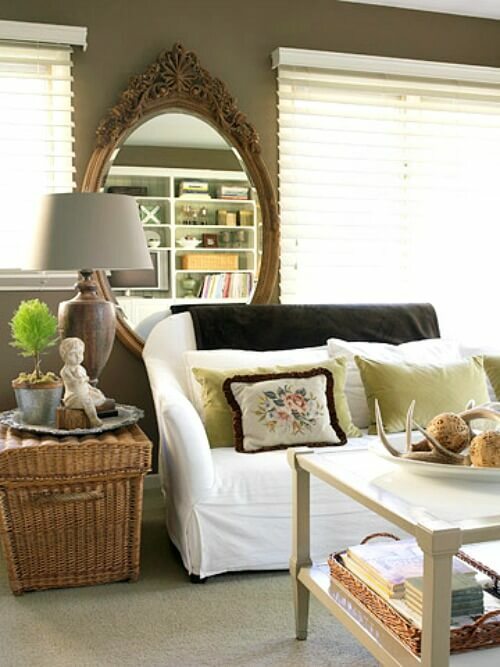 They chose to decorate in Belgium style by mixing raw woods, natural fabrics, vintage accents and modern pieces. 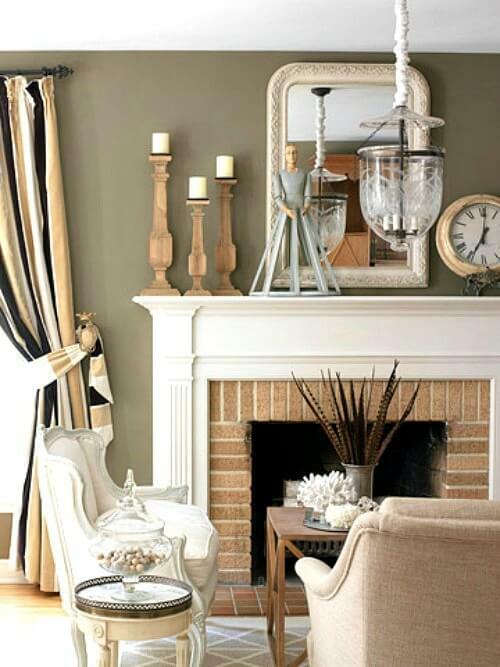 They selected a European color palette of grays, browns, and earth tones. The fireplace has the signature Belgian principle of sharp contrasts. They bought the French love seat and sofa abroad. 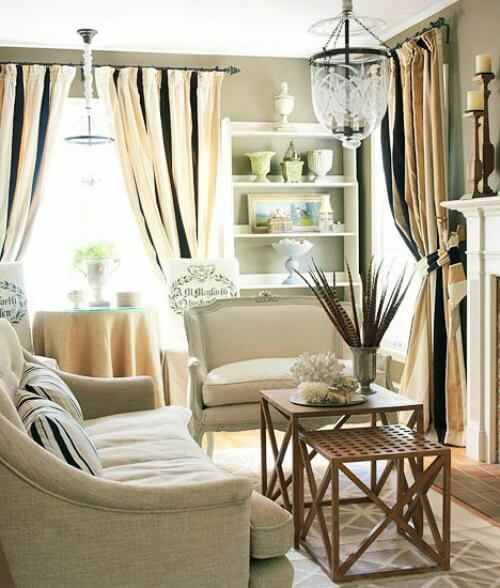 Natural fabrics such as burlap, hemp, velvet and linen, which is a Belgian specialty, are found throughout the home. Antique hemp grain sacks printed with the owner’s name and crest were repurposed as slipcovers for the Parsons chairs. They began with pre-made black, camel, and ivory striped velvet drapes and backed them in burlap fabric with a thick lining in between. They found a favorite landscape painting in Switzerland. The painting inspired the use of blue and green colors in the living room. 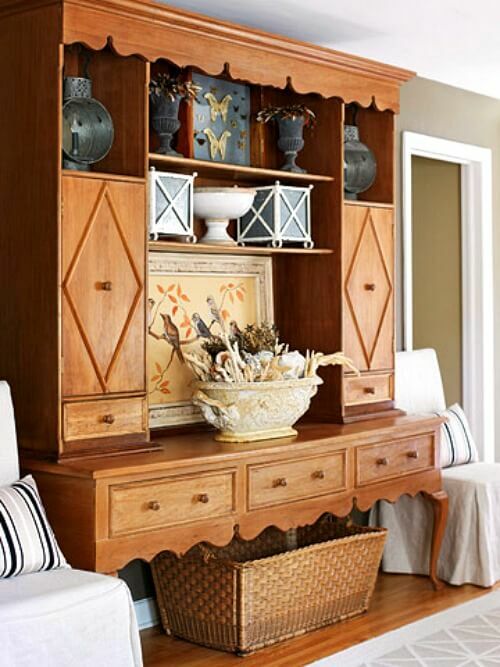 The light wood grain of this cabinet ties in with the other natural materials used throughout the home. I love the colors in this vignette. 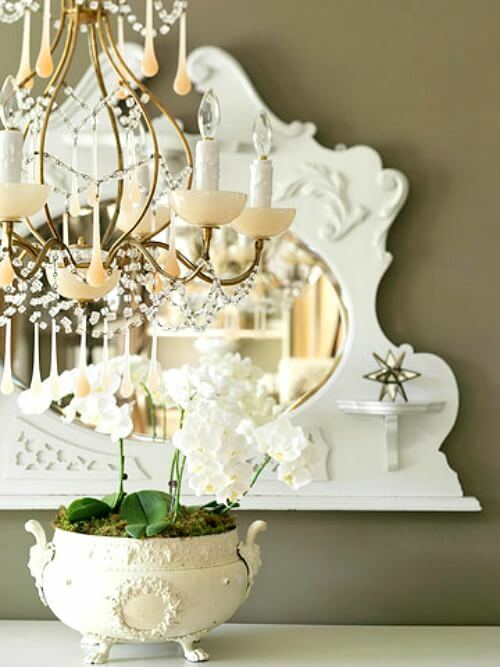 So vintage pretty and filled with texture and creativity. 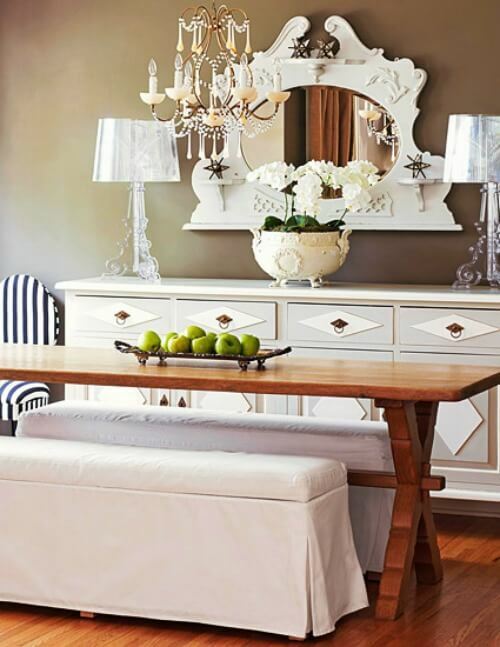 A farm table has been paired with two upholstered benches, giving the dining space a casual look. Benches rather than chairs were used because benches can be tucked under the table to use less floor space. 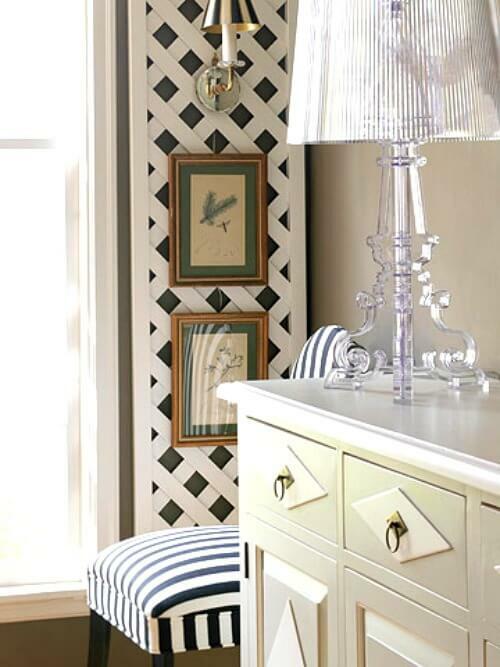 What a great idea to add a trellis to the wall. 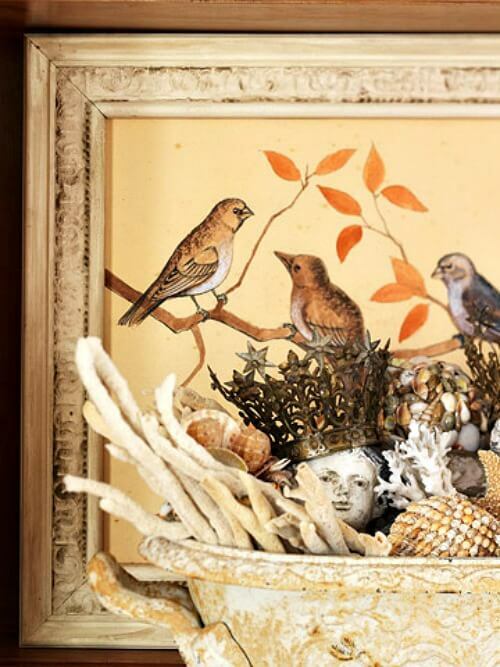 Gives the room a bit of whimsy and is a wonderful place to hang paintings, etc. 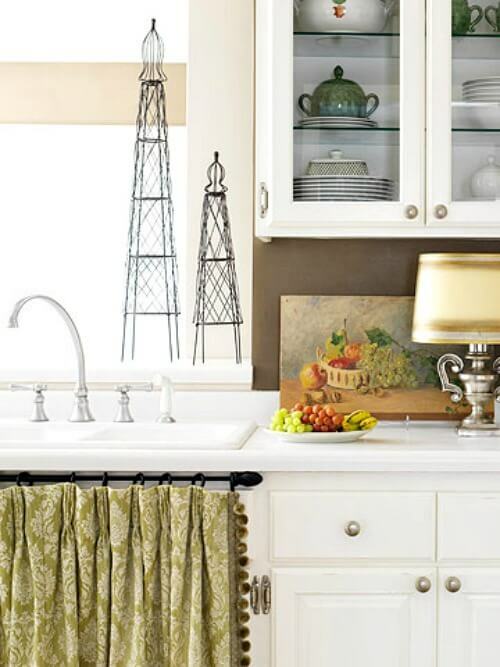 In the kitchen white cabinets stand in high contrast to the room’s chocolate wall color. Glass-front cabinets above the counter create an open feel. The chocolate brown color continues into the family room. The homeowners made the small living room feel larger by creating clusters of seating around the room. 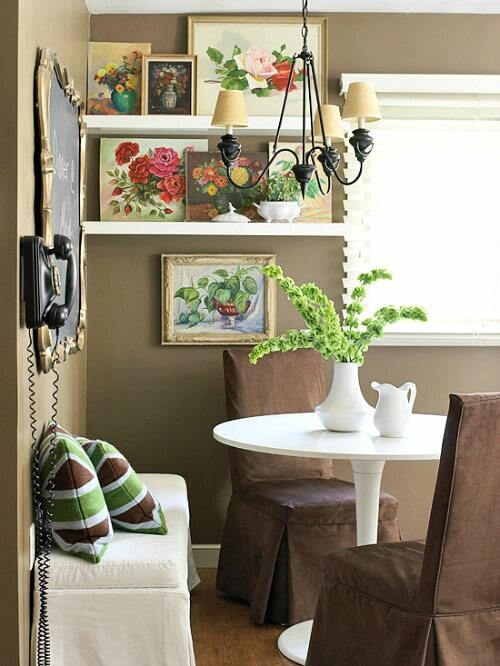 They created a small breakfast banquette in this corner with upholstered seating and a tulip table, which doesn’t take up much space. 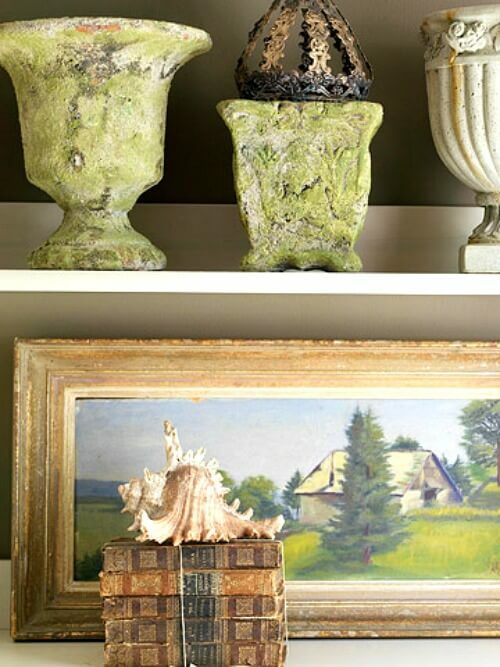 A collection of “Sunday Flower Paintings” adorn the shelves. A chalkboard in a vintage frame became the family’s message center. I hope you enjoyed this small space tour. I like it. I lived in Belgium for about six years, and it does have a style of its own. One of my favorite shops in Brussels is Flamant, which carries lots of gorgeous furniture. Beautiful. I could put this in my home and I wouldn’t change a thing. So restful! Love love it all. I love the natural wood with the whites. Their home is soft, cozy and welcoming. 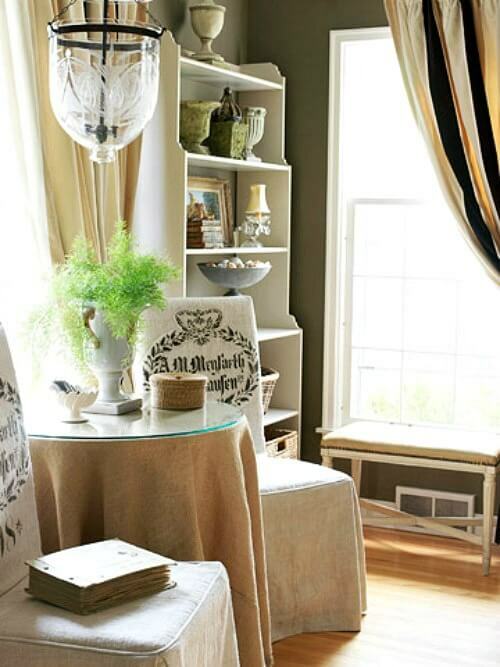 I’ve always loved a ‘picnic’ bench in a dining room and that one is lovely. except for the “shin bruiser” spanning its length. have you ever banged your shins on it? i have! very disconcerting as a guest and scooting your chair a bit too far in. oh my! hurts so bad it brings tears to one’s eyes! I like the contrast of the dark walls with the lighter upholstered furniture and the mix of wood pieces. I hope Abi is doing better.